Compact in size, the R980T is an efficient bookshelf solution for desktops and small spaces. Producing a total 24 watts of sound (12W RMS each), the R980T are the perfect well-rounded stereo speaker. Each speaker contains a 4-inch bass driver and 13mm tweeter that clearly replicates enjoyable sound for listeners. The powered amplified bookshelf speakers conveniently connect to any device that has a 3.5mm headphone output or dual RCA output. Connect to two devices via AUX at the same time, no plugging and switching needed. Any audiophile’s desire to have a proper studio setup will be fulfilled with the R980T powered bookshelf speakers. 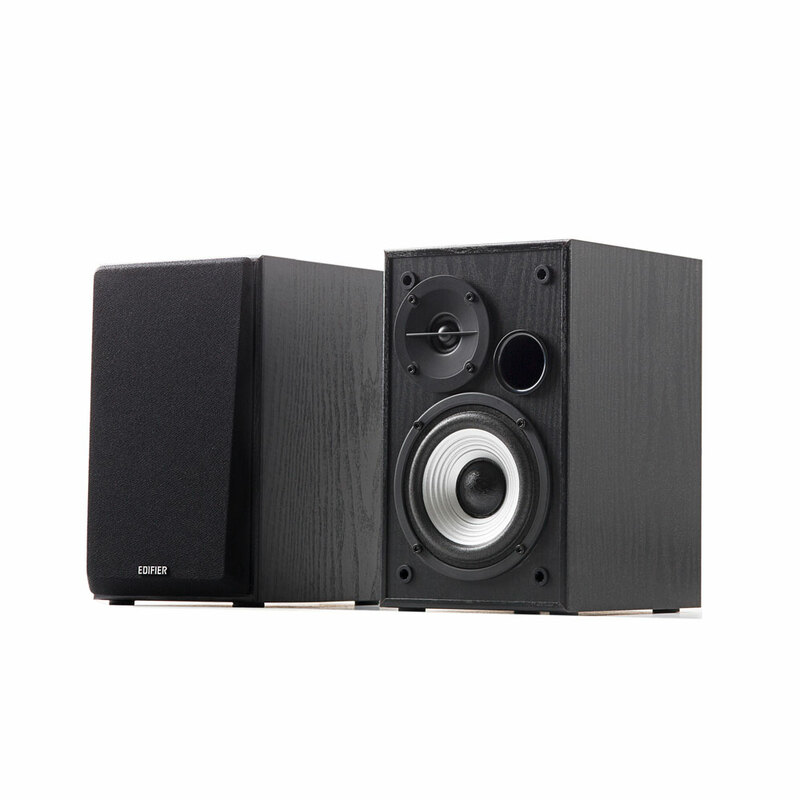 The sound produced from Edifier’s R980T satisfies any detail oriented reviewer; its hailed for being vibrant and alive filling the room with rich sensations. These amplified bookshelf speakers exemplify the idaea of big things coming in small packages. The R980T powered amplified bookshelf speakers offer a sound that is full of presence and depth. Designed for enhanced bass, the R980T bookshelf speaker system is calibrated with a flared bass reflex port. Resulting in rich detailed sound that will take your breath away. This flared bass reflex port is encased in a 100% medium-density fibreboard wooden enclosure. The wooden accent encompassing the full package of the R980T bookshelf speakers compliment both a home, studio and office setting. The classic wood finish enclosures are brilliantly designed to minimize acoustic resonance while simultaneously producing a clean finish any audiophile will enjoy. The R980T powered amplified bookshelf speakers can be connected to more than one audio device through the two RCA inputs. Connect to both your PC and Television or record player with the R980T stereo speakers. No need to switch inputs. Master volume and bass knobs easily adjust both the audio and bass levels. These knobs are located on the back of the active speaker, allowing for a tailored listening experience. Reviewers of the R980T are consistently impressed by the bass performance that these speakers produce and the modern feel of the classic design. The R980T allows for a unique aesthetic perfect for any home. The volume, bass and power switch on the back are easily accessible along with aux inputs; all working together to produce power at your fingertips.